Abelard and Heloise are one of the most celebrated couples of all time, known for their love affair and for the tragedy that separated them. Peter Abelard was a French philosopher, considered one of the greatest thinkers of the 12th century. Among his works is "Sic et Non," a list of 158 philosophical and theological questions. His teachings were controversial, and he was repeatedly charged with heresy. Even with the controversy that surrounded him at times, nothing probably prepared him for the consequences of his love affair with Heloise, a relationship destined to change his life in dramatic ways. Heloise was the niece and pride of Canon Fulbert. She was well-educated by her uncle in Paris. Her uncle's love for her was equaled only by his desire that she should have the best education which he could possibly procure for her. Wishing to become acquainted with Heloise, Abelard persuaded Fulbert to allow him to teach Heloise. Using the pretext that his own house was a "handicap" to his studies, Abelard further moved in to the house of Heloise and her uncle. She was supposedly a great beauty, one of the most well-educated women of her time; so, perhaps it's not surprising that Abelard and she became lovers. She was more than 20 years younger than Abelard. Fulbert discovered their love They were separated, but that didn't end the affair. Instead he discovered that Heloise was pregnant. Abelard moved Heloise away from Fulbert and sent her to his own sister in Brittany, where Heloise gave birth to a boy, whom she called Astrolabe. 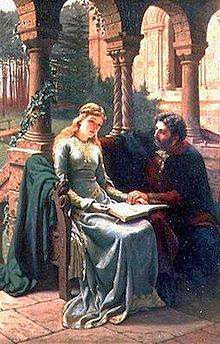 Abelard agreed to marry Heloise to conciliate Fulbert, although on the condition that the marriage should be kept secret so as not to damage Abélard's career; Heloise was initially reticent to agree to the secret marriage, but was eventually persuaded by Abelard. Heloise returned from Brittany, and the couple were secretly married in Paris. Fulbert, however, began to spread news of the marriage, in order to punish Abelard for the damage done to his reputation. Heloise attempted to deny this, but this ongoing situation eventually caused Abélard to place Heloise for her own safety in the convent of Argenteuil, where Heloise had been brought up. Fulbert and his friends, however, believed that Abelard had simply found a way of getting rid of Heloise, by making her a nun. So, to punish Abelard, a group of Fulbert's friends broke into Abelard's room one night and castrated him. After castration, filled with shame at his situation, Abélard became a monk in the Abbey of St Denis in Paris. At the convent in Argenteuil, Héloïse took the habit. She eventually became prioress there, but she and the other nuns were turned out in 1129 when the convent was taken over by the Abbey of St Denis. At this point Abélard arranged for them to enter the Oratory of the Paraclete, a deserted building near Nogent-sur-Seine in Champagne which had been established by Abelard himself in 1122. Héloïse became abbess of the new community of nuns there. Heloise and Abelard agreed that they must take Holy Orders as Monk and Nun. In a heartbreaking moment, Heloise gave up her child, knowing that she will never see him again. Through their famous correspondence of twenty years, their love continued to flourish, in spite of their separation. After many years pass, in a chance meeting, Heloise and Abelard are briefly reunited at a ceremony in Paris. Though they have been physically apart all these years, at last in the sight of the other, the former lovers realized that the love they share is the reason for human existence. As the glorious ceremony begins, they triumphantly promise to remain “Forever One”. They never met again, yet through their famous letters, their love endures. Six hundred years later, it was Josephine Bonaparte, so moved by their story, the she ordered that the remains of Abelard and Heloise be entombed together at Pére Lachaise cemetery in Paris. To this day, lovers from all over the world visit the tomb where the remains of Heloise and Abelard rest eternally together. If you have a story, photo, suggestion, complains or any other concern, comment below ..